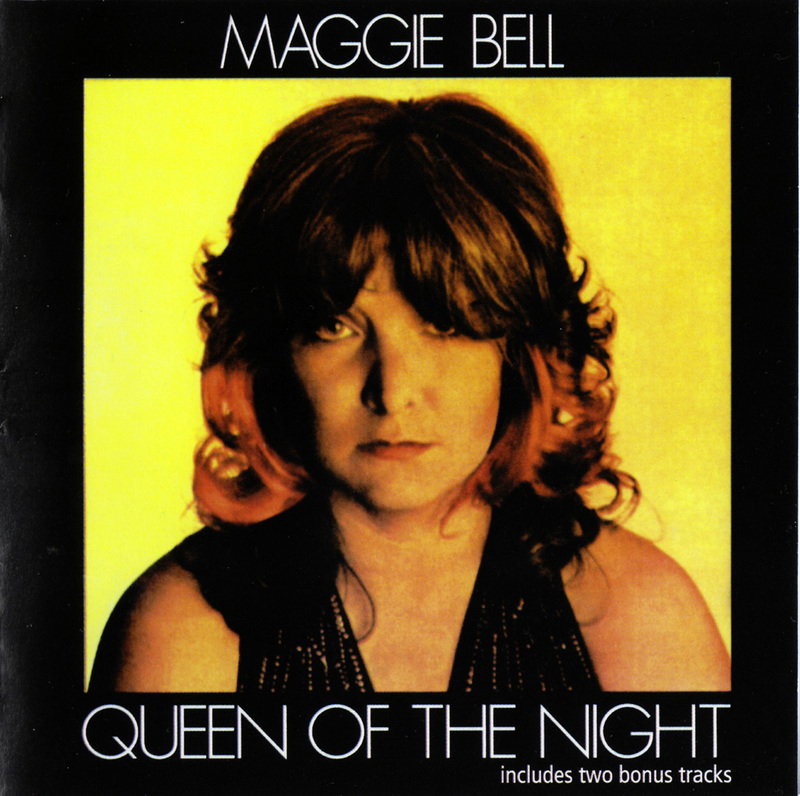 Producer Jerry Wexler puts the earthy vocals of Maggie Bell in a beautiful setting here. She stretches John Prine's "Souvenirs" to the max with Steve Gadd ably assisting by splashing the drums as deep as Bell's vocals. Her uptempo version of J.J. Cale's "After Midnight" is more captivating than Eric Clapton's; she oozes that Etta James sexuality while Reggie Young throws some tasty guitar into the semi-calypso groove. Bell's identity is unique on much of the material, but a couple of tunes have her paying tribute to some of her sisters. The title track, "Queen of the Night," is drenched in gorgeous harmonies by the Sweet Inspirations and is pure Genya Ravan, but conversely, the cover of "A Woman Left Lonely," embraced totally by Janis Joplin on Pearl, is a sweet vocal and totally alien to how Joplin ripped the song to shreds so wonderfully. It works on an entirely different level on Queen of the Night -- Bell's voice is an instrument that slips into different styles on a moment's notice. She takes the fun but silly Ringo Starr/Vini Poncia number five hit from the same year and gives it some style, then turns around with Deadric Malone's "As the Years Go Passing By" and delivers another brand of quality sound. Cornell Dupree's fabulous guitar leads cook in the background -- the frosting on the cake for "As the Years Go Passing By." Intense and beautiful, it is the real sleeper here. While Merry Clayton was singing backup on Ringo Starr's "Oh My My" and ex-Black Oak Arkansas Ruby Starr would track Paul McCartney's "Maybe I'm Amazed," Bell broke through her Stone the Crows image to cover a range of ideas, giving even David Clayton Thomas some respectability, taking his original "Yesterday's Music" to new heights with a Bonnie Bramlett-style touch of gospel. From Will Jennings to Carole Bayer Sager and Peter Allen, Bell's Queen of the Night is a stunningly marvelous mix of blues, pop, soul, and Southern rock. "We Had It All" builds with a smoldering tension that gives Bell a platform for her inspired phrasings. Sager must've been over the top when she first heard this version of "The Other Side." This is music straight from the heart, which concludes with "Trade Winds," piano, drums, and Bell's voice tapering off like the end of a great set at some intimate nightclub. This is an extraordinary creation worth pulling out when you want to appreciate a fine wine like Queen of the Night.